Home » Posts » Uncategorized » November is Pet Health Month! November is Pet Health Month! The Animal Medical Center of Mid-America is celebrating “Pet Health Month” this November to raise pet parents’ awareness for National Pet Diabetes Month, National Pet Cancer Awareness Month and National Senior Dog Month. Noticing the various symptoms and navigating diseases can be difficult tasks for pet parents. Pet owners are encouraged to schedule regular checkups for their furry friends to help maintain proper health as they age. For more information or to schedule a checkup, call the Animal Medical Center of Mid-America at 314-951-1534 or visit www.amcma.org. Pet Cancer Awareness Month: Pet cancer is one of the leading causes of disease-related death for pets. Studies have found approximately one in four dogs and one in five cats will develop cancer during their lifetime. Early detection is the key to treating these pets and giving them their best chance of survival. Common symptoms to check for in your pet include lumps or bumps, a swollen abdomen, chronic weight loss, vomiting, diarrhea, non-healing wounds or unexplained bleeding, coughing or difficulty breathing, lethargy, and any evidence of pain. Take your pet to the vet if any of these issues arise. Pet Diabetes Month: Pet diabetes is a common problem for cats and dogs, and while there is no cure, there are ways to successfully manage it. Older pets have a higher risk of diabetes, but it can also be linked to genetics and obesity. Be aware of these common diabetes symptoms for pets: increased hunger and thirst, excessive urination, lethargy or weakness, poor skin condition, cloudy eyes and even blindness. As always, frequent vet visits and paying attention to changes in a pet’s behavior can make all the difference. Senior Dog Month: As dogs age, it is natural for them to slow down a bit, but never assume their change in behavior is only due to old age. Regular checkups, especially for senior dogs, may identify conditions that can be treated to keep a dog active and young at heart. November is also “National Adopt a Senior Pet Month.” It’s common for senior pets to wait much longer than younger puppies and kittens to be adopted. But older dogs have a lot of love left to give! They tend to be more laid-back and are usually less work than training a new puppy. 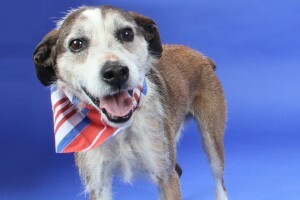 Those interested in adopting a senior dog are encouraged to meet the adoptable dogs at one of the Humane Society of Missouri’s three shelter locations or visit their website at www.hsmo.org.